To Verizon for continued and lasting commitment to Newark and New Jersey. Driving westward on Route 280 from the New Jersey Turnpike, the Newark city skyline looks and feels impressive: an array of handsome commercial towers, high-rise residential buildings, and factories casting shadows across the final bend of the Passaic River. The characteristic skyline preceded the recent upsurge in construction accompanying the successful launch of the New Jersey Performing Arts Center-and stands as testament to Newark’s long and storied history as New Jersey’s capital of business, finance, shipping and manufacturing. While the fortunes of our state’s largest city have ebbed and flowed over the past century, its functionality, vitality, geographic assets and suitability for private enterprise have rarely been disputed. To the extent that Newark’s current revival has been driven by cultural renewal, it is important to remember that this renewal has been generously funded and supported by the businesses and institutions that have formed the city’s bulwark. Downtown Newark has long been the home of many of the state’s largest and most philanthropically active corporations. Verizon may be a new name in lights on the skyline, but as Bell Atlantic and New Jersey Bell Telephone, the company has been headquartered at 540 Broad Street since 1929. Since opening its doors 73 years ago, the company, which employs more than 18,000 people statewide, has displayed a lasting commitment to the revitalization of Newark and the enrichment of New Jersey life. Last year, executives at Verizon New Jersey decided to renew the covenant between the company and its city by agreeing to a substantial renovation and expansion of its landmark headquarters building-a decision which will keep the corporation in Newark well into the foreseeable future and ensure that Verizon continues to weave its firm and anchoring threads into the colorful municipal fabric. 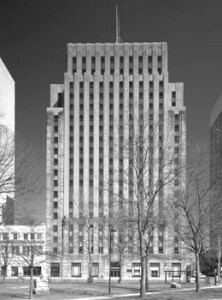 The renovation of the headquarters in the heart of the downtown district is the most visible symbol of the telecommunications company’s productive relationship with Newark. Verizon is spending more than $46 million to improve and modernize the historic Art Deco edifice-a building which stands indisputably as a psychologically important fixture on the city skyline. 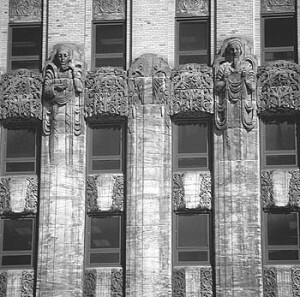 Architectural features suggestive of the company’s (and also the city’s) history are being reinforced and rehabilitated, and the exterior brick and stonework is being cleaned and restored. Upon completion in 2003, Verizon will have enhanced more than 428,000 square feet of office space, providing a thoroughly modern workplace for 1,400 employees. Verizon’s decision to renovate and upgrade reflects good business sense as well as loyalty and civic-mindedness. The proximity of the downtown district to PATH trains, Newark Penn Station, and the new direct rail link with Manhattan at Broad Street Station makes the city an attractive location for commuters. Office space is relatively inexpensive to rent when compared with neighboring Manhattan, and the city is home to research institutions such as Rutgers and NJIT, and an increasingly young, diverse, and well-educated populace. Thanks in part to Verizon’s investment and charitable contributions, Newark has become one of the most “wired” cities in America, and it has remade itself into an appealing host city for new technology companies requiring significant bandwidth, such as IDT and Net2Phone. Newark’s heightened status among technology-friendly municipalities is the fruitful outcome of many years of intense development-development shared by New Jersey cities statewide. During 2001, Verizon spent more than $1 billion to expand, streamline, and modernize the networks of servers and routers that comprise New Jersey’s busy telecommunications grid. The company has connected 2,300 schools and libraries to its network, providing Internet service and high-speed connections, and is supporting this investment in the future with more than $32 million in free equipment and $34 million in service discounts. Through the Verizon Foundation, the corporation has provided $2 million in grants to support technology initiatives for students and job-training programs for adults. The charitable foundation has been active in Newark, contributing to many high-profile community and educational organizations, including the Newark Literacy Campaign, Project GRAD Newark, and the Newark Boys Choir School. Moreover, Verizon has been an invaluable sponsor of the New Jersey Performing Arts Center, and, consequently, the commercial resurgence that has accompanied its opening. A new Verizon sign – shining 300 feet above Broad Street and visible for miles – takes its place among the sights of the Newark city skyline, looking as inevitable and comfortable as the corporation’s relationship with its host city. By tethering its fortunes so resolutely to those of Newark and New Jersey, Verizon has provided more than an investment of dollars: it has provided an investment of faith in continued progress and development. Like the many other companies who have chosen to revitalize and restore downtown Newark, Verizon is now uniquely positioned to reap the rewards and advantages of that commitment – access to and identification with a functional and exciting municipality and a position of indisputable leadership in a great American city that is once again on the rise.